Lottie Austin and George Evelyn have repeatedly shown their willingness to commit personal time and resources to increasing community awareness and appreciation of the arts. Professor Emeritus in the Department of Music and recipient of the Distinguished Teaching Award, George Evelyn developed a fundraiser for the U of L Singers called the Festival of Art and Song. A founding member of the U of L's Planned Giving Committee, Lottie Austin chaired the Festival of Art and Song Committee for several years, and was key to the festival's success, ensuring it met and exceeded its fundraising goal every year. Lottie and George share a passion for education and music performance, and an expertise in administration. The U of L's arts and music programs have received broader awareness through their efforts. Lottie Austin and George Evelyn agreed to be co-chairs of the Music in the Making campaign, and have been critical in its success. George and Lottie co-chaired this campaign, which was designed to benefit the U of L Music Conservatory. 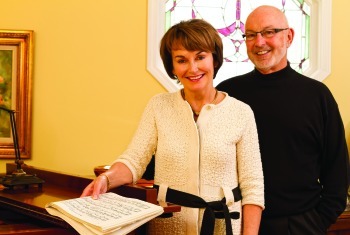 Launched in 2011, the Music in the Making campaign surpassed its fundraising goal of $500,000, thanks to Lottie and George's efforts to rally supporters of the arts and of the University. Campaign funds will support the purchase of appropriate equipment and musical instruments for the Music Conservatory's new space in the Community Arts Centre in downtown Lethbridge. The success of this campaign will allow the Conservatory to successfully relocate to its new home. For their unwavering commitment to the U of L and the community, Lottie Austin and George Evelyn are the recipients of the 2012 Senate Volunteer Award for volunteer work on behalf of the University of Lethbridge.